Allergies – may prevent allergies developing among young animals in response to inhaled substances such as mold or pollen, as well as treating skin conditions caused by allergies, such as miliary dermatitis and eosinophilic granulomas. Autoimmune conditions – lessen harmful effects on the body. Cancer – omega-3s slow development of certain cancers (though omega-6s can stimulate faster growth of tumours). Cholesterol and plasma triglycerides – decrease blood levels of cholesterol and triglycerides, reducing risk of heart disease. Eyes – aid proper development of visual cortex and retinas. Hyperlipidemia – a condition that sometimes afflicts animals receiving synthetic derivatives of vitamin A (retinoid therapy) – fish oil supplements may provide benefits. Kidney disease – may help prevent or slow progression. Seborrhea – this flakey skin condition may be caused by a deficiency in a certain fatty acid – supplementation can mitigate its effects. Ulcerative colitis and inflammatory bowel disease – reduces inflammation. Yeast infection – slows growth of Malassezia pachydermatis, which commonly afflicts cats and dogs. Not all pets need the same fatty acids. For example, arachidonic acid is essential for cats but not dogs. Also, certain conditions cause a deficiency of the enzymes that convert fatty acids into other fatty acids. In such cases, a nonessential fatty acid may become essential, and should be given as a supplement. Additionally, animals that are placed on diets may suffer deficiencies in fatty acids and require supplementation. Most supplements are derived from fish and flaxseed oils. Fish oil, which contains omega-3s in their active form, has proven more effective in treating certain conditions than flaxseed oil. In the case of inflammatory diseases (such as arthritis or allergies), flaxseed oil is effective with some pets, and flaxseed oil may offer the added benefit of reducing the risk of cancer. However, certain cats, dogs, and people are unable to convert the ALA in flax seed oil to the active form found in fish oil, so fish oil is the recommended choice, unless the animal is allergic to fish. The effects of supplementation are not immediate. Usually, it takes at least a month before any benefits are realized, and in some cases it may take several months to discover whether the supplements are working. Side effects of fatty acid supplementation are uncommon. Some pets develop diarrhea, but beginning with a low dose of the supplement and gradually increasing it to the therapeutic dose decreases the likelihood of this side effect occurring. In rare cases, pancreatitis, which causes vomiting, diarrhea, pain, and dehydration, will develop. The most common side effect of fish oil supplementation is fishy breath. However, effects of long-term or high-dose supplementation have not been determined, and fatty acid supplements may interact adversely with certain medications. Overcooking or improperly storing a pet’s food can destroy fatty acids. 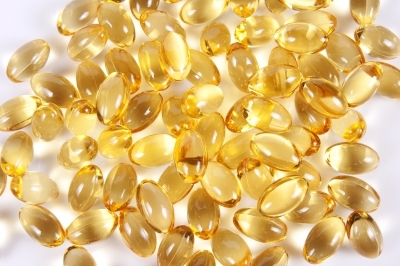 Fish oil supplements can decrease the level of vitamin E in the body, so supplements should be fortified with extra vitamin E.
Fatty acid supplements are most effective in treating various conditions when used in conjunction with other supplements or medications. Fatty acid supplements should be tailored to an individual pet’s needs. Different conditions require different combinations of essential fatty acids, and ratios of fatty acids differ from one supplement to another. Your veterinarian can make recommendations based on your pet’s unique medical profile. Also, pet supplements are not very aggressively regulated, so it’s important to get a recommendation for a specific supplement from a qualified practitioner. Always consult a veterinarian before giving nutritional supplements to your pet. Messonnier, Shawn, DVM. (n.d.). “Getting the Fat on Fatty Acids.” K91Training.Tripod.com. Nash, Holly, DVM, MS., Veterinary Services Department, Drs. Foster & Smith, Inc. (2011). “Omega Fatty Acids: Sources, Effects & Therapeutic Uses in Cats.” PetEducation.com.